Do Gaming And Game Characters Help Political Campaigns? During the political campaigns for the recent election, some candidates made promises. Some candidates talked trash. And some candidates used video games to make their point. Did gaming give those politicos a 1Up in office? Website GamePolitics has a round-up of some of the politicians that used gaming in their campaigns. Take Missouri Congressman Russ Carnahan (D), who ran a Pac-man inspired online game called Hackman. 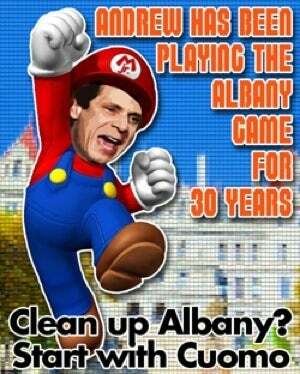 Or New York gubernatorial candidate Carl Paladino (R) who used Super Mario against his opponent Andrew Cuomo. Both Carnahan and Paladino lost, and their political careers are in another castle. The evidence is largely anecdotal, but flash games and game imagery doesn't seem nearly as effective as, say, robocalls or television commercials. The implementation, however, is still in its infancy and is bound to get increasingly sophisticated over time.